Earn 9 NATE CEH Credits and 4 BPI CEU Credits for continuing education while learning about indoor environmental quality, water efficiency, innovation, materials and resources and more! 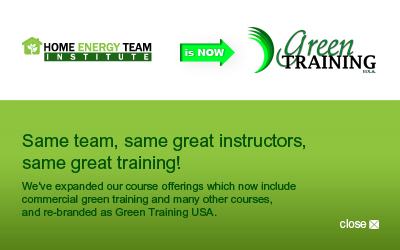 Taught by one of the green building industry's most respected experts, Eric Corey Freed. It's a fantastic course to improve your knowledge of sustainable, efficient building and design, and a great way to earn 9 NATE continuing education CEH credits. If you're interested in getting your LEED AP BD+C accreditation, this course provides everything you need to prepare for the LEED accreditation exam. Register today! The fast, easy way to earn NATE CEH credits.